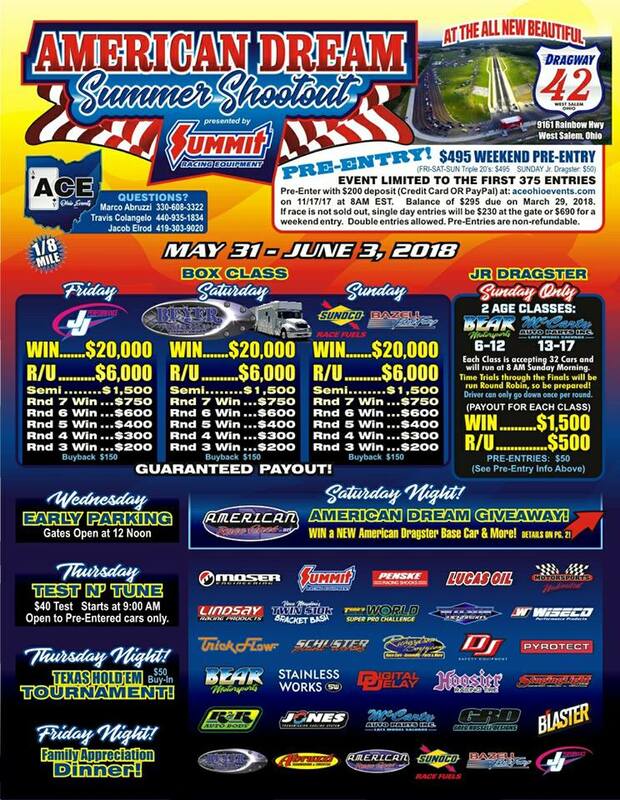 Thanks to our coverage partners at D3TV, we present to you the live video feed from the American Dream Summer Shootout at Dragway 42. 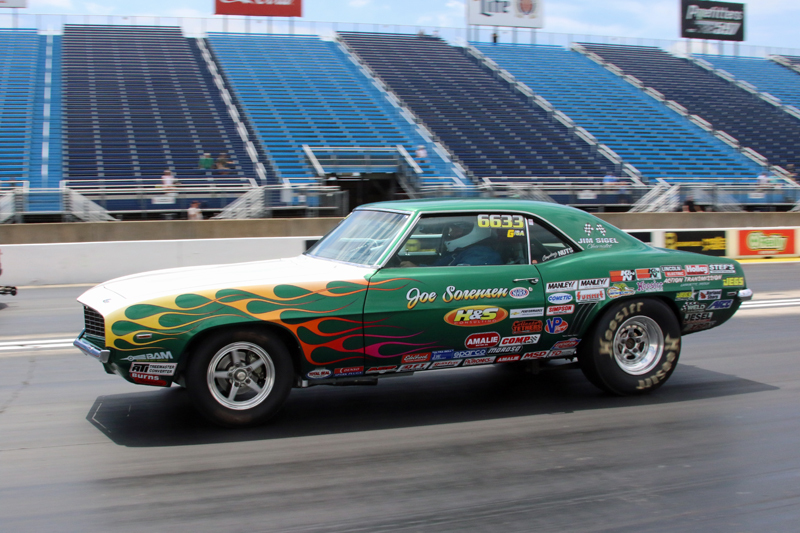 Stock Eliminator racer Joe Sorenson wanted to make a strong impression headed into Saturday's Jegs All-Stars competition. 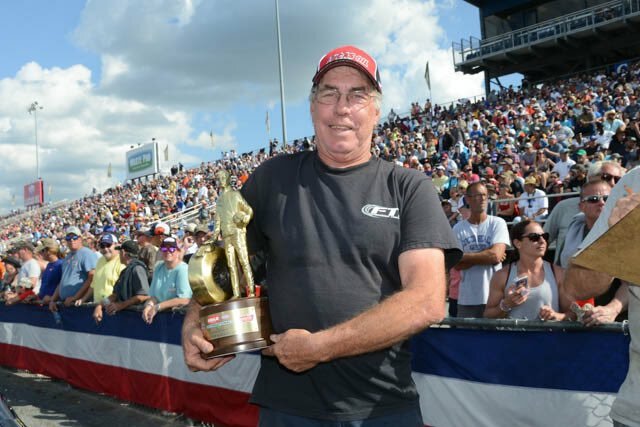 Chase Williams led the list of nine winners who were crowned JEGS SPORTSnationals Champions in the NHRA Lucas Oil Drag Racing Series at Beech Bend Raceway Park. 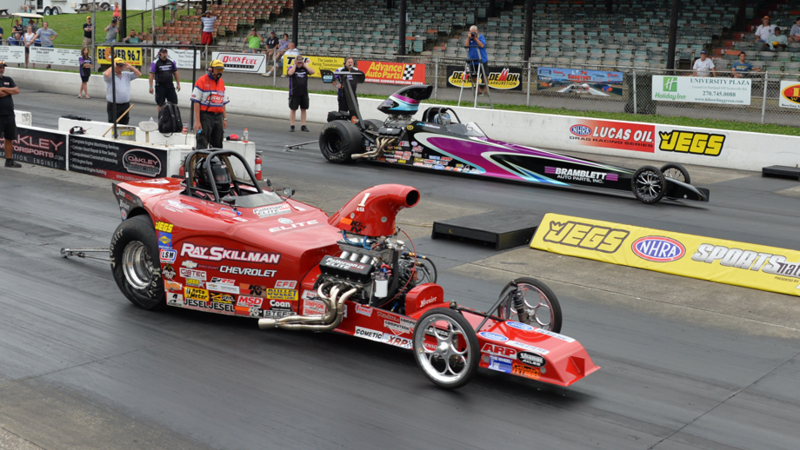 Williams met up with David Rampy in the Comp Eliminator final and drilled the tree with a .001 second reaction time propelling him to the win in 6.819 seconds at 175.34 mph. Rampy who advanced to his 154th national event final tipped the clocks at 7.315, 154.69. Steve Collier's plan headed into the NHRA Heartland Nationals was to focus more on the performance of the quickest car in the family's stable of race cars. Collier qualified No. 4, running a personal best 5.375, 254.66, and after a first-round victory appeared poised to make a run deep into eliminations. After winning the first round, he advanced to the semi-finals when Monroe Guest fouled. Only one driver has this prestigious trophy on his mantle. There are eight others with a chance to join the two-time Pro Modified champion Mike Ashley in this exclusive club of one. 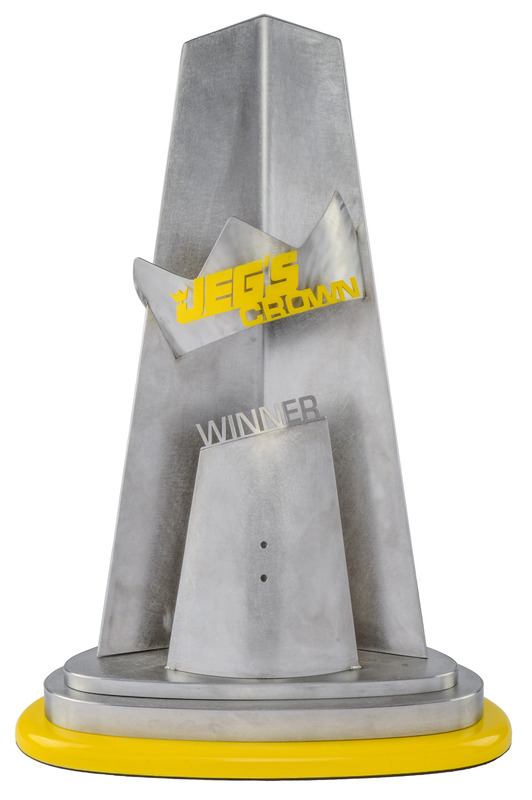 The Jegs Crown is one of the most sought-after awards in sportsman drag racing, earned only by winning both Jegs Sportsnationals events in a single season. 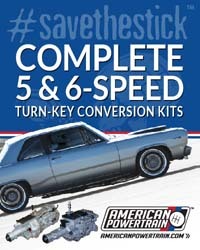 In the final results from Auto Club Dragway at Auto Club Speedway and the NHRA Lucas Oil Drag Racing Series, local racers Ross Wilson, San Bernardino, Calif., and Phil Mandela Jr., Upland, Calif., took home the wins in Comp Eliminator and Stock Eliminator respectively. Wilson, with a starting line advantage, raced down the track with a pass of 8.309 seconds in his final round victory over Randy Jones, Monarch Beach, Calif., who clocked in at 8.839 seconds. Only a few races into his Top Alcohol Dragster career, Troy Coughlin Jr. drove the JEGS.com McPhillips Racing rail to the winner's circle by dominating the Cavalcade of Stars presented by Budweiser Sunday in what was clearly the best car of the meet. 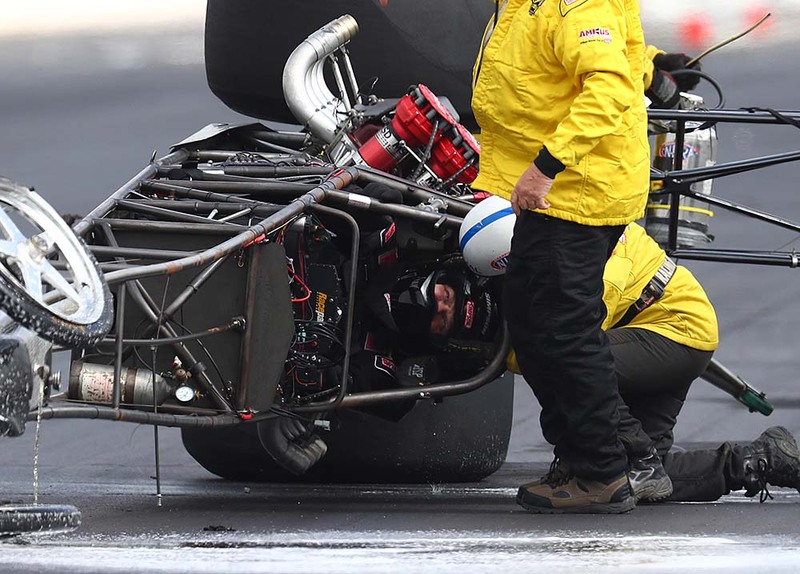 The JEGS NHRA SPORTSnationals, widely regarded as one of the biggest and finest weekends in Sportsman racing, returns to Beech Bend Raceway Park in Bowling Green, Ky., for the third consecutive year on Memorial Day weekend, May 25-27. The event, which will feature three days of intense racing action from the top sportsman racers in the country, will have a purse of more than $108,000, along with special bonus races and national event product contingency awards. NHRA and South Georgia Motorsports Park officials announced today that based on the current weather conditions at South Georgia and the forecast this week leading up to the scheduled NHRA Lucas Oil Drag Racing Series event, the decision has been made to postpone the event until September 7-8, 2018.